Makkah: Saudi Arabia’s King Salman Bin Abdul Aziz vowed on Saturday to find out what caused a crane collapse that killed 107 people at Makkah’s Grand Mosque ahead of the annual Haj pilgrimage. The Haj, which last year drew about two million faithful, will take place despite Friday’s tragedy, Saudi authorities said as crowds returned to pray a day after the incident. 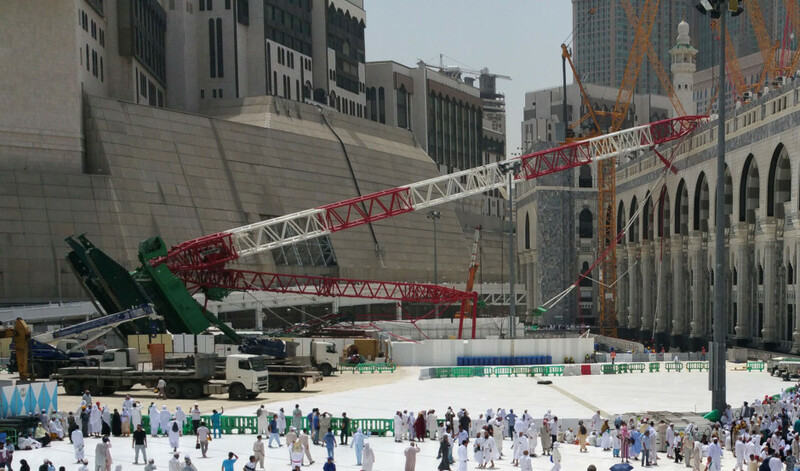 Parts of the Grand Mosque remained sealed off on Saturday around the wreckage of the crane, which also injured over 200 people when it crashed into a courtyard. But pilgrims continued to arrive in numbers at the mosque. “I wish I had died in the accident, as it happened at a holy hour and in a holy place,” Egyptian pilgrim Mohammad Ebrahim said. Salman expressed his condolences to the families of the dead, and then visited a local hospital “to check on the health of the injured”, the official Saudi Press Agency said. “Suddenly, I heard thunder and then we heard a very loud noise. That was the sound of the crane falling,” Mohammad, a Moroccan pilgrim, told AFP. Another visitor caught up in the tragedy, Ahmad from Egypt, said he and those around him were “very scared, hysterical even”. A Saudi official said the Haj, expected to start on September 21, would go ahead despite the tragedy. “It definitely will not affect the Haj this season, and the affected part will probably be fixed in a few days,” said the official, who declined to be named. The pilgrimage is a must for all able-bodied Muslims who can afford it. An investigative committee has “immediately and urgently” begun searching for the cause of the collapse, SPA reported. The contractor engaged in a major expansion of the mosque has been directed to ensure the safety of all other cranes at the site, it added. For years, work has been under way on a 400,000-square-metre (4.3-million-square-feet) enlargement of the Grand Mosque to allow it to accommodate up to 2.2 million people at once. Pictures of the crane collapse tragedy on Twitter showed bloodied bodies strewn across the courtyard, where part of the crane had landed atop an ornate, arched and colonnaded section of the complex. 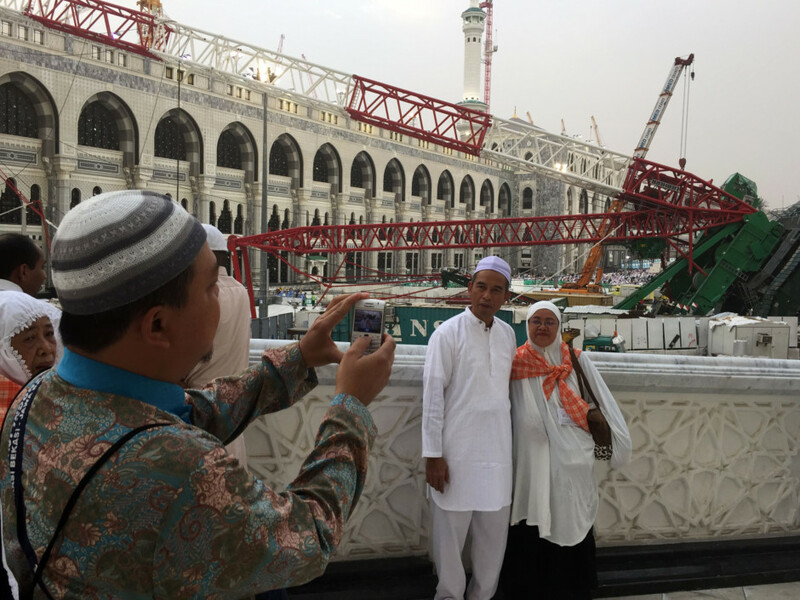 Irfan Al Alawi, co-founder of the Makkah-based Islamic Heritage Research Foundation, suggested that the authorities had been negligent by having a series of cranes overlooking the mosque. But an engineer for the Saudi Binladin Group, the developer, told AFP the crane had been installed in “an extremely professional way” and that there had been no technical problem. Saudi Binladin Group belongs to the family of the late Al Qaida leader Osama Bin Laden. Shaikh Ahmad Al Gamdi, former head of Makkah’s religious police, told AFP the accident was a “test” from God. “We need to accept what happened,” he said, at the same time calling for a thorough investigation. Condolences came in from around the world, including from Arab leaders, as well as from Britain, Canada, India and Nigeria. It was not the first tragedy to strike Makkah pilgrims, although the Haj has been practically incident-free in recent years. In 2006, several hundred people died in a stampede during the Stoning of the Devil ritual in nearby Mina, following a similar incident two years earlier.